Yikes. . . my baby is going to be three in 16 days! Last year, we celebrated JSL’s second birthday at Walt Disney World. 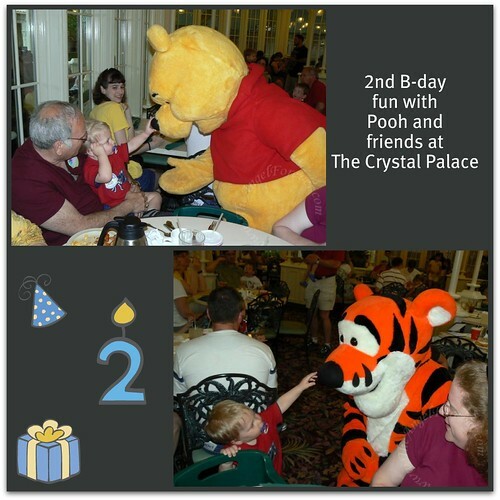 We actually had an extra special meal at The Crystal Palace where JSL began his love for Winne the Pooh, Tigger and friends. During our first day at Animal Kingdom in February, JSL kept crying to see Pooh Bear. 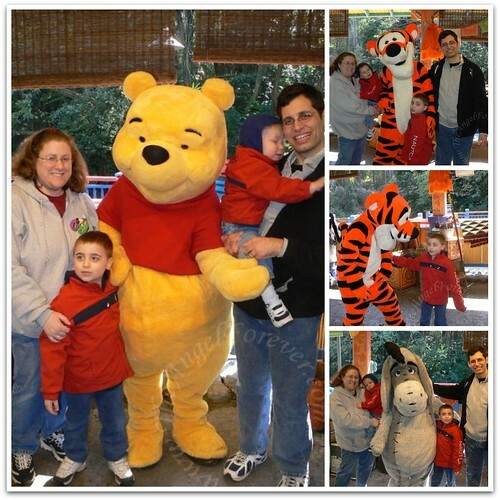 While we tried to go on rides, see animals and have fun with other things….he kept demanding to see Pooh, Tigger and company. After a while, we finally made our way to the area that had Pooh, Tigger, and Eeyore (my favorite). Flash forward to the last month or so. JSL has been beyond attached to all things Winnie the Pooh. Thank goodness, I think we have all of his birthday presents set. Seems like it would be easy to find Winnie the Pooh things right? Well, we thought so until we started to look at stores and found next to nothing. Who knew that getting things having to do with Winnie the Pooh would be so difficult in our area? Of course, not having a Disney Store here does not help matters. Had we known this would be a dilemma, or seen JSL’s fascination continuing all this time, we probably would have bought a few special items while at Disney Social Media Moms Celebration. At the time, JSL bought a set of Pooh Bear characters that he loves and takes all over the place with us (another post on that coming soon – along with the items that we have found). Later in the week, we have to go out and get a few birthday supplies. Once again, I plan on making JSL his birthday cake. This started with his first birthday and has continued with each subsequent celebration for the boys. Since we are obviously doing a Winnie the Pooh theme, I need to figure out a cake. I was thinking of taking the giant Wilton Cupcake pan and making it into a Honey Pot a la Winnie the Pooh style. So my question: Do you have any other homemade cake ideas that would go along with a Winnie the Pooh theme. Remember, I am not trying to end up on Cake Wrecks here. Thanks in advance for any suggstions. Hey, I’m here to lessen your birthday burden. At this age don’t go overboard. My son had a 5 yr Star Wars party. I took some of the new Galactic Heros characters he was getting as presents and made a little scene with them ontop of a flat cake. Easy-peasy and he LOVED it! Green frosting is Pooh’s Grass…you get the picture! A Honey Pot should be fairly easy to shape out of a 9×13 pan, right? You could shape it and use yellow and red frosting if you wanted to get really fancy, but I agree with Maryellen about going with simplicity! You can definitely just do a plain cake and get little characters to decorate it. I think they have Pooh and friends figures at the Disney Store that would be the perfect size! When I made my daughter’s cake(s) for her first bday I used the frozen buttercream transfer technique. I think this was a relatively easy way to get a great image on the cake. (I can show you pics if you want to see). I was also going with honeypot and I think you could bake the bottom of the giant cupcake pan twice and then stack the two together to form the honeypot. Add some bees and a figurine of Pooh and voila!! !